We are pleased to work with our parent organization, Tempe Sister Cities, in participation in the international Young Artist program. Since 1988, the Sister Cities International Young Artists Showcase has encouraged youth from around the globe to consider the honorable mission of Sister Cities International and express their interpretation of that mission promoting peace through mutual respect, understanding, cooperation through one individual, one community at a time. Hundreds of artists have shared their talent with the sister cities community over the past 20 years. 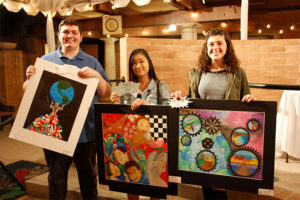 Each September, Sister Cities International Program chooses a theme for high-school aged artists to portray in their annual competition. The students compete within their home town, with each city choosing its own winner to be entered into the worldwide competition. The next competition is January 23, 2019. Please contact our Young Artist Director, Robin Sprague, for more information call 602-616-9297 or rd.sprague@yahoo.com.